and, finally, although most counter-maps composed since 1995 rely on computational and algorithmic procedures to encode, present, distribute, and analyze data, they are best understood as humanistic documents, documents in which, in Johanna Drucker’s words, “interpretation, ambiguity, inference, and qualitative judgment take priority over quantitative statements and presentations of ‘facts’” (“Overview,” n.p.). —contemporary counter-mappers crunch spatial, temporal, social, and historical data into documents with ethical, political, and, we believe, poetic stakes. Our argument here is not technologically determined: although the affordances of GPS, GIS, remote satellites, and API set the bells and whistles of recent counter-maps, they do not call the tune. Just as William Bunge and his crew of Detroit teenagers worked from municipal records of accidents and reports of rat bites, Denis Wood and his students drew on online historical data, aerial imagery, and Google Street View images of Boylan Heights. “But,” Wood continues, importantly, such information is “all disaggregated, inchoate. Something’s missing, maybe the poetry” (Everything 29). What gives counter-maps their distinctive pattern is not, for Wood, “the new technologies with their satellites, their gazillion miles of optical fiber, their computer hardware, and their miraculous software (that is . . . their extraordinary capitalization)” but rather “the new attitudes, visions, and radical philosophies of the counter-mappers” (Rethinking 111). Like Bernes, Clover, and Spahr, who pin the genre of poetry back to “the coronation of kings, the praise of nations, the vindication of the ways of god (or the gods) to man, [and] the counting and administration of the wealth of the rulers” (“Self-abolition”), Wood positions maps as administrative instruments designed to convert social energy into social order through “[t]he ceaseless reproduction of the culture that brings [them] into being” (1). Set up by local, state, and national governments, regulated and enforced by the courts, the police, and, in extreme situations, the military, maps establish ownership, set borders, and configure zones for taxation, voting, school attendance, housing, and commerce. “Once a map has been published,” Wood concludes, “it is pretty much taken for a description of the way things actually are. . . . The map’s propositional character becomes . . . hard to see” (Rethinking 2-4, second ellipsis in text). 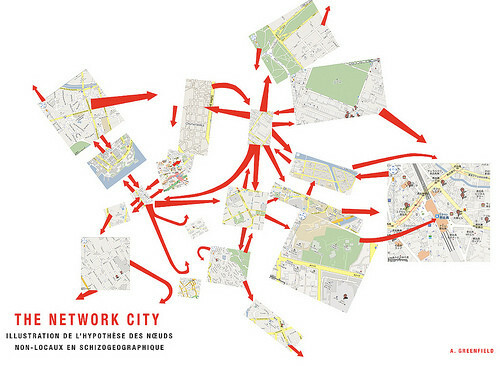 To borrow the Situationists’ term for what Wood calls “attitudes, visions, and radical philosophies,” counter-maps détourne—hijack, divert, misappropriate—official cartographic instruments and protocols: they use what Wood calls “a poetics of cartography” (Everything 19) to expose the fact that maps—along with the data sets and technologies used to chart them—are not neutral: they have designs on how we live and what we do. As Hakim Bey puts it, more pungently, a “‘map’ is a political abstract grid, a gigantic con enforced by the carrot/stick conditioning of the ‘Expert’ State, until for most of us the map becomes the territory. . . . Hidden enfolded immensities escape the measuring rod. The map is not accurate; the map cannot be accurate” (101). Bordered by North Carolina’s maximum security prison for men on one side, the state’s central psychiatric hospital on another, and, on a third, a cement factory and railroad line, these redrawn maps show Boylan Heights to be not just a Deleuzian society of control or feeder for a Fordist industrial zone but also, and importantly, if not a utopia something like one of Bey’s “temporary autonomous zone[s]”: a non-hierarchical space exhibiting the potential of potential, a virtual space that belongs to multiple alternative local ecologies. Wood and his students map the night sky visible above Boylan Heights’ main intersection, the city’s geological substructure with intruded arteries (water mains, gas lines) and veins (sewage pipes), pools of light spilled at street corners, zones of sound constructed by wind chimes and barking dogs, squirrel highways strung between poles carrying electricity and information out of and back into national and international communication grids, paper routes bringing in The Raleigh Times and garbage routes carrying the daily paper to the dump, sidewalk graffiti, a ballet of bus routes, and jack-o’lanterns set out on porches. The agenda of these maps, as Wood’s readings demonstrate, is to make alternative epistemological and ontological patterns as real as any other facts about Boylan Heights. How is 21st-century counter-mapping related to the radical practices of the classical avant-garde? In what way is the contemporary counter-mapping culture at once constrained and enabled by technologies developed by states and corporations for purposes of control, surveillance, and military maneuvers in a global theater of multinational contention and crisis? The five rough divisions to come—forensic maps, embodied or locative maps, protest maps, memory maps, and eco-maps—have been chosen from a range of emergent alternatives to offer a glimpse into both the poetics of cartography and a cartographics of contemporary poems. This matters because, as Wood insists, maps are about complicity: they show what we agree to agree is the way things are. This entails, as he emphasizes, an ethics of civic, environmental, and global responsibility: “When someone drops a bomb on something and kills a bunch of kids,” Wood explains to an interviewer, “and they do that using a map that you made, you either accept the responsibility for it—a kind of well, you can’t make an omelet without breaking some eggs responsibility—or you say, ‘Damn it, I can’t do this anymore’” (Everything 134). The counter-maps in the columns-to-come provide what geographer Laura Kurgan calls “a certain intimacy” with the technologies of the knowledge practices that surround us. They allow, that is, “an encounter with their opacities, their assumptions, their intended aims” (14) that not only foregrounds their ethical and political stakes (14) but suggests some of their implications for contemporary poetic practice. Bey, Hakim. T.A.Z. : The Temporary Autonomous Zone, Ontological Anarchy, Poetic Terrorism. 2nd edition. Brooklyn, NY: Autonomedia, 2003. Drucker, Johanna. Graphesis: Visual Forms of Knowledge Production. metaLABprojects. Cambridge, MA: Harvard University Press, 2014. Kurgan, Laura. Close Up at a Distance: Mapping, Technology, and Politics. New York: Zone Books, 2013. Presner, Todd, David Shepard, and Yoh Kawano. Hypercities: Thick Mapping in the Digital Humanities. metaLABprojects. Cambridge, MA: Harvard University Press, 2014. Wood, Denis. Everything Sings: Maps for a Narrative Atlas. Second edition, revised & expanded. Siglio: Los Angeles, CA, 2013. --------, with John Fels and John Krygier. Rethinking the Power of Maps. New York: The Guilford Press, 2010.